Skelvis! 24×18″ pastel on paper. ©2018 Marie Marfia. When I was in college I did a lip synch video to Elvis’s immortal “Devil in Disguise.” I enlisted the help of my sister and a friend, dressed one like an angel in a pretty white frock and the other in red flannel underwear with a tail and horns. They took turns dancing on my shoulders throughout the song through the use of video magic (well, it was magic back then). I was dressed as a tele-evangelistic minister in a sharp suit and tie, with my hair slicked back and holding a leather-encased bible. Flash forward to this week when someone asked me if I’d yet done Elvis as a skeleton. The suggestion immediately brought back all the fun we had making that video. Truly, it was the highlight of my college career, not even kidding. When my dad saw it later, I heard he laughed himself silly. High praise indeed. To paint The King, I needed just the right reference photo. I didn’t find Devil in Disguise but I did find Jailhouse Rock. Looking it over, it occurred to me that a ribcage can look a lot like a striped uniform shirt, and well, he came together pretty quickly after that. And now all that hip-shaking sexiness is available for you to have for your very own! The original (18×24″ on paper, unmatted and unframed) is $600 and in my shop. You can also have him to grace your walls as a canvas wrap print, paper print, or a greeting card. Do you know someone who loves the King and skeleton art? Please share. 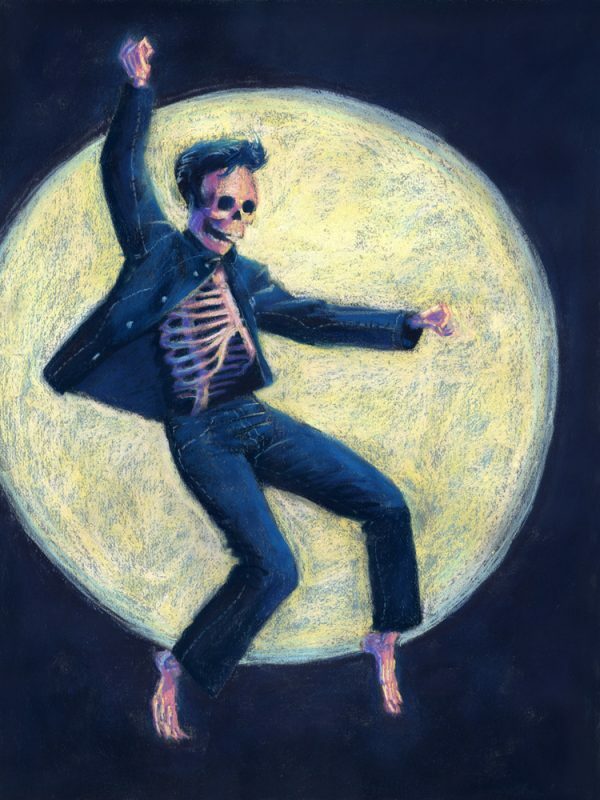 This entry was posted in Pastels, Skeleton, skeletons, skelly and tagged Elvis, Jailhouse Rock, skeleton, skeleton art on May 15, 2018 by Marie Marfia.